1. What is Drone, Inc.? 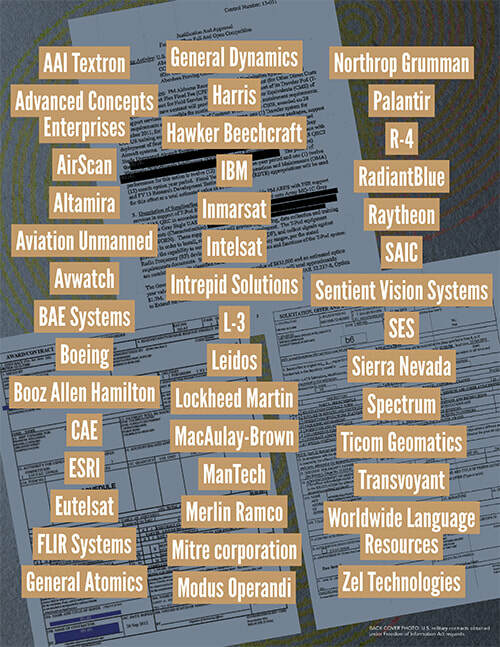 Drone, Inc. is a CorpWatch report on the contractors and the technologies used by the U.S. intelligence agencies and the U.S. military to conduct targeted killing from remotely piloted aircraft. These aircraft, popularly known as drones, are just one part of a complex interlocking system of “intelligence, surveillance and reconnaissance” that has become a linchpin of U.S. war doctrine. We explain the inherent flaws in each of the major hardware and software components of the system. 2. What’s new in this report? * The first published overview of companies responsible for designing and operating specific aspects of the drone and targeted killing program. See page 58 of the report. Download the spreadsheet here. * Revenue figures for some of the biggest drone contractors. The data is derived from contracts issued between 2008 and 2017 by the Aeronautical Systems Center, Intelligence Surveillance and Reconnaissance/Special Operations Forces Directorate, parent office of Big Safari. See page 67 of the report. Download the spreadsheet here. * Revenue figures for the biggest Distributed Common Ground System contractors. This data is derived from Department of Defense prime- and sub-contract databases from FY2009 through FY2016. See page 51 of the report. Download the spreadsheet here. * Pentagon evaluation documents on the Air Force Distributed Common Ground System (AF-DCGS)— essentially the “brain” behind the drone system. The documents, obtained under the Freedom of Information Act, show that the AF-DCGS was unavailable 67 percent of the time. See page 55 of the report. Download the document here. * An explanation of how the U.S. Air Force is now essentially using semi-autonomous systems to track targets, which don't work and cannot work accurately. This is called "cross-cueing" and essentially it allows soldiers to watch individuals based on the computer's guess as to the location of a targeted individuals. See page 38 of the report. * Details of two lawsuits (Netezza and Ticom) on the failure rates of two key drone technologies used to identify phone locations of targeted individuals. See page 35 and 40 of the report respectively. Background documents are available on request. 3. What materials are available for reproduction? CorpWatch is making available Drone, Inc. (download here) and the accompanying video animation (see here) under a Creative Commons license. You may re-publish any section or the whole report in any reasonable manner, but not in any way that suggests that CorpWatch endorses you or your use. Please credit CorpWatch when re-using any materials from this report. We link to almost all our sources from the online version of the report. Anything that is not online can be provided free upon request such as our data spreadsheets which are available for reproduction with citation. We have also created ten unique graphics (see list below) to help illustrate how each of these technologies work. You may re-publish any of the graphics, so long as you credit CorpWatch.